The MK 48 ADCAP torpedo is the U.S. Navy’s current submarine-launched torpedo. This heavyweight, acoustic-homing torpedo has sophisticated sonar and all-digital guidance-and-control systems; its digital guidance system allows performance improvements to be made through software upgrades. The U.S. Navy established the Research Torpedo Configuration (RETORC) program in 1956 to develop technologies for advanced torpedoes in the face of the Soviet Navy’s ongoing development of advanced submarines. A specific heavyweight project emerged by 1960 after the need for a replacement for the submarine-launched MK 14, MK 16, and MK 37 torpedoes was identified as one of the Navy’s greatest needs. The development goals for the new torpedo included a range of 35,000 yards, a minimum speed of 55 knots, and a depth capability of 2,500 feet. The Navy awarded a project definition contract for the MK 48 Mod 0 to Westinghouse Electric and Manufacturing Company in 1964. 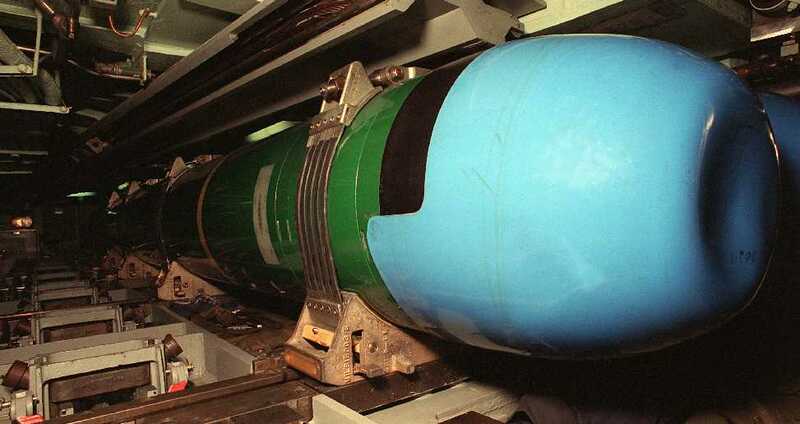 After Westinghouse encountered unexpected technical problems and delays, the Clevite Corporation was contracted under the technical direction of the Naval Ordnance Laboratory to build test vehicles that became the MK 48 Mod 1. A subsequent design competition between the MK 48 Mod 1 and Mod 2 (a redesign of Westinghouse’s Mod 0) demonstrated the turbine engine of the Mod 2 — a Navy specification — was expensive and did not perform as well as the Mod 1’s external combustion axial-piston engine. The Mod 2 project was terminated and Westinghouse was contracted to manufacture 52 of the Mod 0 units. In 1971, USS Trigger (SS 564) tested the MK 48 variants by firing live warshot torpedoes. Of three hits, the Mod 0 sank two ships and the Mod 1 sank one. The Navy decided, with careful analysis, to put the Mod 1 in production and the first MK 48 Mod 1 torpedoes were delivered to the Submarine Force by the Gould Corporation, which had taken over Clevite, in 1972. The Mod 3, introduced in 1977, added two-way telecommunication that allowed transmission from the torpedo’s sonar back to the submarine’s fire control system. Future upgrades were driven by a need for a torpedo that could counter the Soviet high-speed Alfa attack submarines. Production of the Mod 4, which added speed and a fire-and-forget capability that enabled the launching submarine to immediately take evasive action after firing a torpedo, began in 1980. An upgrade to existing torpedoes while Advanced Capability (ADCAP) technology was being developed was designated the Mod 5. Advanced Capability was introduced with the Mod 6, which began production in 1985. The MK 48 ADCAP had a new nose with digital electronics and inertial guidance (replacing the gyro system) that reduced electronics volume, allowing for an increase in fuel capacity. The design retained the pre-ADCAP piston engine and propulsor, but with a greater fuel flow rate to increase speed. These changes were made by possible in part by the introduction of integrated circuits, including microprocessors. The ADCAP is the first torpedo that can use the Navy’s Torpedo Downloader System, which allows torpedoes already in service to receive rapid software updates through their digital guidance systems. The first MK 48 ADCAP torpedoes entered submarine service in 1988, with the USS Norfolk (SSN 714) making the first warshot launch on July 23. Full ADCAP production was approved the next year. The MK 48 ADCAP (Mod 6) remains in service today as the Navy’s primary submarine-launched torpedo, but a Mod 7 variant, the Common Broadband Advanced Sonar System (CBASS) reached Initial Operational Capacity in 2006 and was successfully tested during a July 2008 exercise. CBASS is the product of a joint development program between the United States and Australia to create a fully digital, wideband sonar that would allow the ADCAP to be used in littoral environments. This website is operated by the Naval Undersea Museum Foundation, a private 501 (c) 3 non-profit organization chartered to support the U.S. Naval Undersea Museum, an official Navy museum. This website and reference to the U.S. Naval Undersea Museum do not constitute an endorsement by the United States Department of Defense or the United States Department of the Navy of non-US government sites, information, products or services contained therein. Although the United States Department of the Navy may or may not use these sites as additional distribution channels for Department of Defense information, it does not exercise editorial control over the information you may find at these locations.